Enjoy only the finest farm stays in PA. See our list of the best farm stay vacations in PA.
Come and Enjoy the Slower Pace of Life! 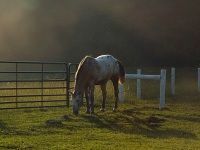 Mountdale Farm is a perfect picturesque farm stay right in Central PA. This is the place to escape from the hustle and bustle of everyday existence, and experience a little peace where there's a slower pace of life. Ken and Sally Hassinger have opened their rooms, their many cabins, (including both efficiency cottages, and forest cabins), and their home to visitors, and this is the time to take advantage of their offer. Rates are affordable; who can put a price tag on quiet? There are no schedules, no demands - just explore, breathe deep, and enjoy the fresh air. Buck Valley Lets You Wind the Trails on a Beautiful Horse! Buck Valley Ranch offers those who need a rest from the city, a chance to experience what it's like up in the mountains on a real horse ranch. 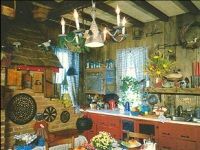 The guest house is spacious and accommodating, with comfortable beds, meals included, and cowboy paraphernalia all over the walls. The surrounding scenery is beautiful in any season, whether you love the leaves in the fall, the snow covered fields in the winter, or the verdant view of summer. Best of all are the horses! 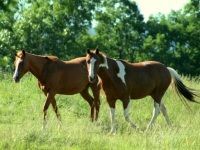 Your rides will be included with any stay; you'll have a chance to slowly wind the trails on a faithful steed, and escape your cares for a while.While this farm stay in Pennsylvania is more of a ranch stay, it's still one of the best in the state. Fun and Relation at Green Acres Farm! Make your next vacation a farm stay in Pennsylvania by visiting the Green Acres Farm Bed and Breakfast - the perfect way to experience real relaxation on a 150 acre working farm! Love animals? Feed the goats, donkeys, and sheep, or pet a kitty! Need some wide open space? Their lush fields, and beautiful orchards are just waiting for you to take a stroll. All their accommodations are cozy, comfortable, and clean; you'll sleep like a baby and see the stars at night. This is a unique opportunity to see different part our wonderful country, and stay in peace and comfort for the right price. A Great PA Farm Stay And Getaway in Amish Country! 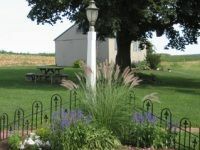 The Old Summer House Bed & Breakfast allows you to stay and enjoy the real working farm of Dennis and Karen Stoner, right in the middle of Amish Country. This is the ultimate escape from the hassle of life; other vacations can make you worry about flight, reservations, etc. You just end up trading one headache for another. One the Stoner's farm however, you'll only peace and relaxation. They take things at a much simpler pace down there, and you will too. You'll be able to wander and explore their farm and garden with no demands on you, and enjoy many fun attractions in the surrounding area. If you've never tried a farm stay in Pennsylvania (or you have and you're looking for a really good one) why not stay with the Stoners this season? One of the Oldest and Best Farm Stays in Amish Country! 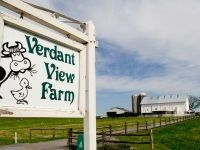 Verdant View Farm in Amish Country has been taking visitors since 1967, making it one of the oldest farm stays in Pennsylvania's Susquehanna Valley. Here you'll really be able to experience farm life, and enjoy the peace and quiet. Milk a cow, take a hike, see the wonderful animals, and generally enjoy the natural scene around you. Why bring the pressures of everyday life with you vacation? Escape them for a while by slipping down to Amish country. What could be better than relaxation, home cooking, green fields, and a warm bed? Come try it for yourself!